A new brand identity positioned Our Community Credit Union as a financial services leader in Washington's peninsula region. Simpson Credit Union had, since its inception as an employee owned financial institution, been synonymous with Simpson Timber Company – its namesake in the Shelton, WA area. Yet membership was dwindling due to several factors including the slow decline in Simpson Timber employment, an aging membership group, and marketplace perception that the credit union was not a primary financial institution. 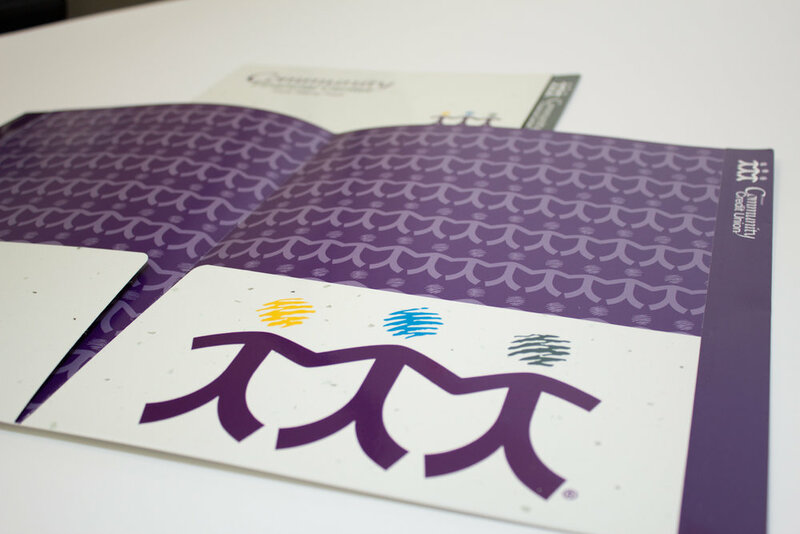 A blend of illustrative and photographic styles helped Our Community Credit Union stand out from competitors. The new brand featured bright colors and an icon that represented the credit union's tagline of "People Helping People." Our first step was to audit all the assets of the current brand and relative position of the credit union in the marketplace, including past and anticipated competition. Further, we interviewed senior management to gain a comprehensive understanding of overall credit union goals and strategies. The resulting strategy called for a phased transition away from the Simpson name towards a new name, Our Community Credit Union (OCCU). We developed a new logo that downplayed the Simpson name as well as created an iconic image to associate with the new name. We seeded the new iconic image in every aspect of community-facing communications, including the interior design of the credit union’s branches. We completely overhauled all print communications material starting with an announcement to existing membership detailing the upcoming changes and member benefits. We shifted the brand to an illustrative style to differentiate OCCU from other competitors in the market. The new illustrative style was fun and inviting and assisted our efforts to define and position the logo image as a central theme to “community as family”. The new OCCU mortgage and financial services centers received a sub-brand that closely aligned each facility to its parent organization. OCCU even purchased an inflatable parade float to support the brand's rollout. Friendly and approachable, the new OCCU logo positioned the credit union as a community member. The brand rollout included all touch points, from name tags to wallpaper. 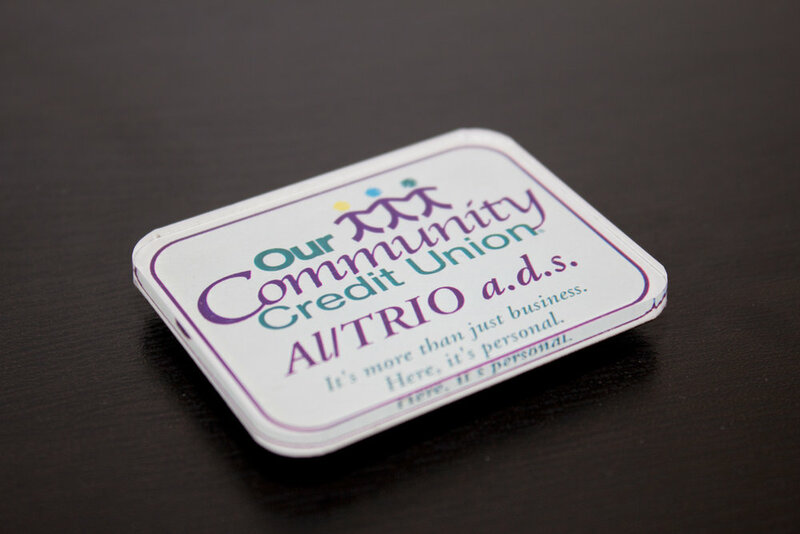 The new logo adorned giveaways for the credit union's customers. Rich photography and thoughtful copy helped OCCU communicate its core mission of serving the local community. OCCU's visual style was a blend of illustrative and photographic to establish a familiar identity that was different from competitors. Trio produced complimentary bookmarks for OCCU using the unprinted areas of press sheets, delivering more value for the credit union's outreach. Quirky illustrative graphics helped OCCU stand out in the mail. The rebranding and marketing campaign was successful in shifting the community's perception of the credit union to that of a primary financial institution. The new brand established OCCU as a local and trusted financial advisor with intimate knowledge of the community, as evidenced by a rapid, six-month shift in community adoption of the new name. Additionally, the credit union doubled its assets through an expansion of services to include mortgage that positioned the credit union as a “primary” financial services provider for the marketplace. The rebranding also affected a shift in the overall membership demographic to a younger, more affluent group. Contact us for more information about how we can help your brand succeed. Thank you! You can expect to hear from us soon.